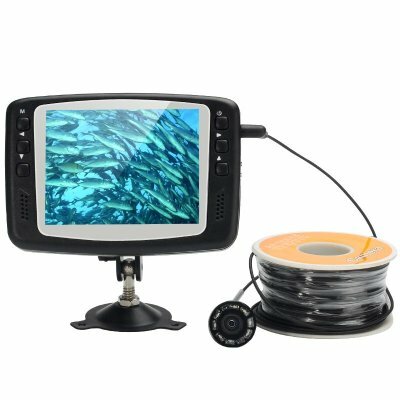 Successfully Added Underwater Fishing Camera - 30 Meter Line, 8 IR LEDs, 3.5 Inch Monitor, 2600mAh to your Shopping Cart. The “Lure Cam” is your underwater fish finder and monitor. This waterproof camera can sit on your fishing line above your lure and provide live footage of any fish within striking range. Equipped with this knowledge you will be able to see the quarry you’re hunting and also know if you have the correct lure or bait for the fish in those waters. The camera will provide you with valuable information such as how fish feed and how they react to your rigs. The lens of this camera has a 160 degree viewing angle and can be positioned in such a way as to give you full view of the lure and all around it. Use this camera when trolling or float fishing and because the monitor is able to sit directly on your rod you will see the second you get a strike or interest in your bait. The camera comes attached to a 30 meter cable and has 8 IR LEDs that help it see in darker waters. Simply connect it to the 3.5 inch LCD screen and you can enjoy up to 4 hours of usage with 320x240 resolutions of all that's happening on the end of your line. Besides fishing this underwater camera can be used for monitoring sea life, scouting dive sites and marine salvage as well as repair and maintenance inspections. This “Lure Cam” fishing camera comes with a 12 months warranty, brought to you by the leader in electronic devices as well as wholesale fishing gadgets..